These No Bake S'mores Bars only have 5 ingredients and can be made in just a few minutes! 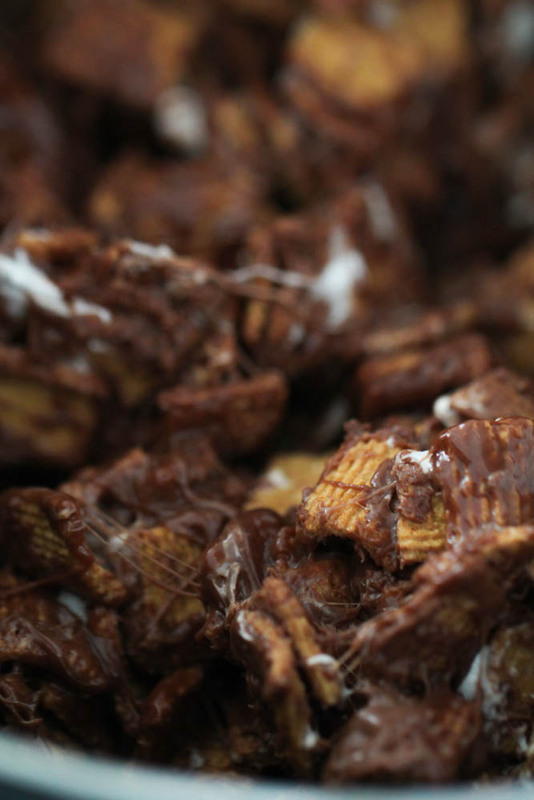 These chewy bars are made with Golden Grahams cereal, milk chocolate chips, mini marshmallows, butter and vanilla extract. I love making s’mores over the campfire, but every once and a while I crave that sweet graham cracker, toasted marshmallow and melted chocolate flavor. These No Bake S’mores Bars are the perfect recipe to make when you’re wanting a s’more but don’t want to deal with the hassle of a campfire! These bars are great to make any time of year and are always a hit at parties and potlucks. Can No Bake S’mores Bars be made ahead of time? 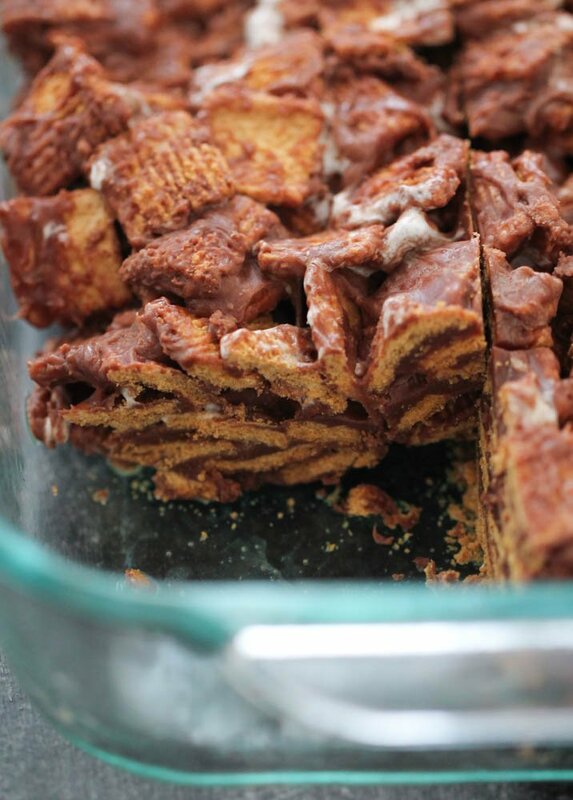 These Easy No Bake S’mores Bars are the perfect dessert to be made ahead of time. Store in an airtight container at room temperature for 2-3 days. 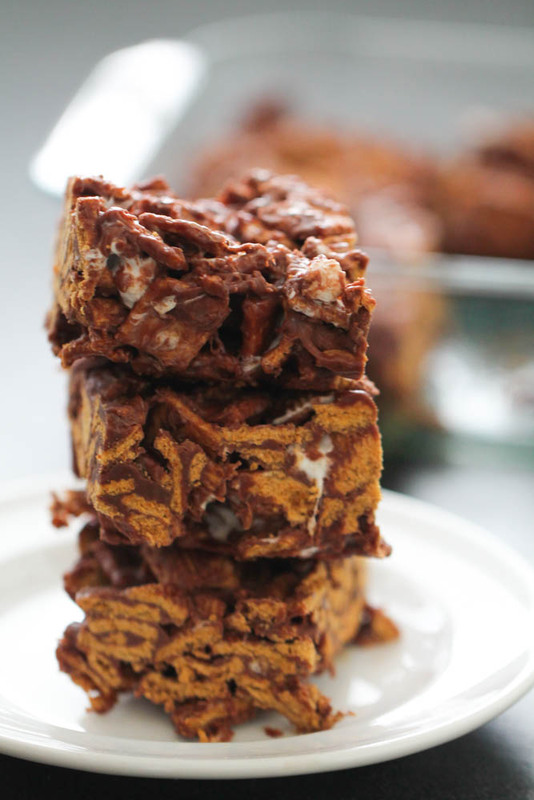 These No Bake S’mores Bars are one of our favorite desserts to make. These bars are so easy to make that even my 8-year-old can make them! Combine mini marshmallows, chocolate chips and butter in a saucepan over medium heat. You will end up mixing 4 cups of cereal in this saucepan, so be sure to use a pan that is big enough for that. 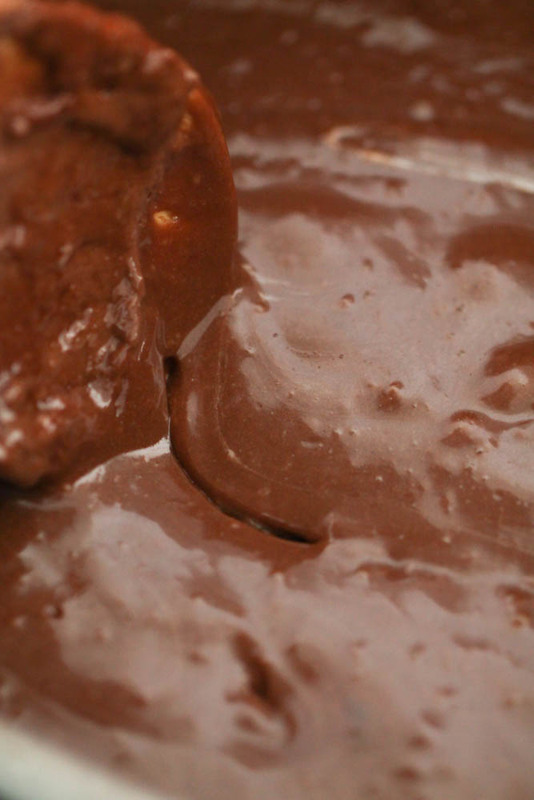 Continue stirring the chocolate mixture until completely melted. Once melted, remove from heat and mix in vanilla. Add cereal to the saucepan and mix until evenly coated. Gently fold in the remaining marshmallows and chocolate chips. Press mixture into a 9×9-inch baking pan that’s been sprayed with nonstick cooking spray. Let cool until set up and cut into bars and serve. I usually cut this recipe into 9 squares, but you could cut this into 12 to feed more people. You could even double this recipe and press it into a 9×13-inch pan if you are looking to have a few more bars. Trust me, after you try these you are going to wish you had more of them. It typically takes about an hour for the bars to set up at room temperature, but if you are short on time you can put them in the fridge to set up faster. Soft and chewy No Bake S'mores Bars that can be made in just a few minutes. Generously spray a 9x9-inch baking pan with nonstick cooking spray; set aside. 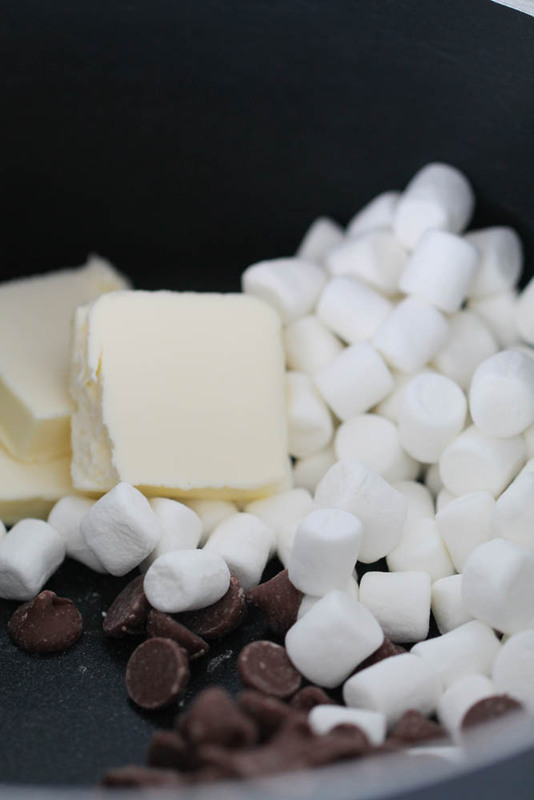 In a saucepan over medium heat, combine 2 cups marshmallows, 1 cup chocolate chips and butter. Stir occasionally, until completely melted. Remove from heat and mix in vanilla extract. Pour cereal in saucepan and mix until evenly coated. Gently fold in remaining marshmallows and chocolate chips. 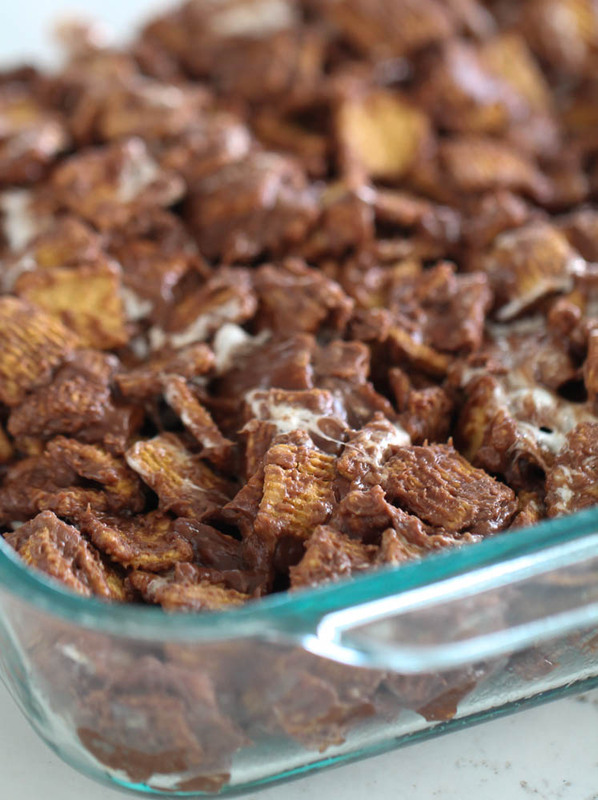 Press cereal mixture into prepared pan and let cool for 1 hour or until set. No Bake desserts make life so much easier in the summer time! My kids are going to love these! 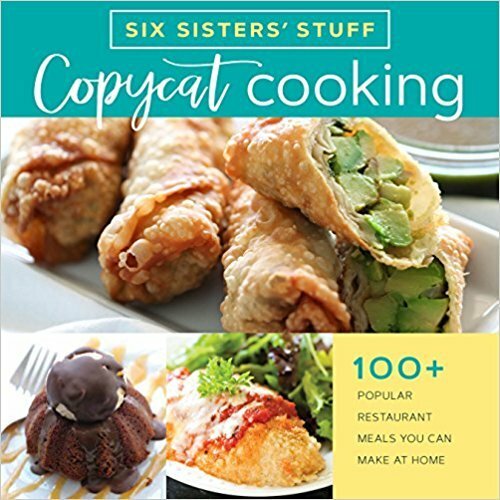 Made these today and they're delicious! I cut them in half only because they're so decadent. I would like to make these for a camping trip. Do you think they would hold up to 2 days of travel? These will be great for a few days in an airtight container. Although these were tasty and enjoyed by the kids, my bars did not hold together very well and fell apart. I measured everything carefully, so I know I didn't add too much (or not enough) of anything. Taste wise these were good and my adult son took the leftover pieces to mix in with his trail mix for his hike the next day but I was disappointed they did not hold together. Made these today, follows the recipe exactly and they did not hold together. Mine fall apart and look nothing like that picture. I triple checked and didn’t miss anything. Maybe there’s a mistake in the post? ?